In winter when the days get shorter, colder, and gloomier, not only do I hunker down with hot tea, a good book, and my knitting needles, I also crave certain foods like starchy soups, stews, and heavy pasta dishes. The best thing to serve with these dishes are a warm piece of crusty bread. I always thought baking bread was a long and involved endeavor. That was until Pinterest arrived. 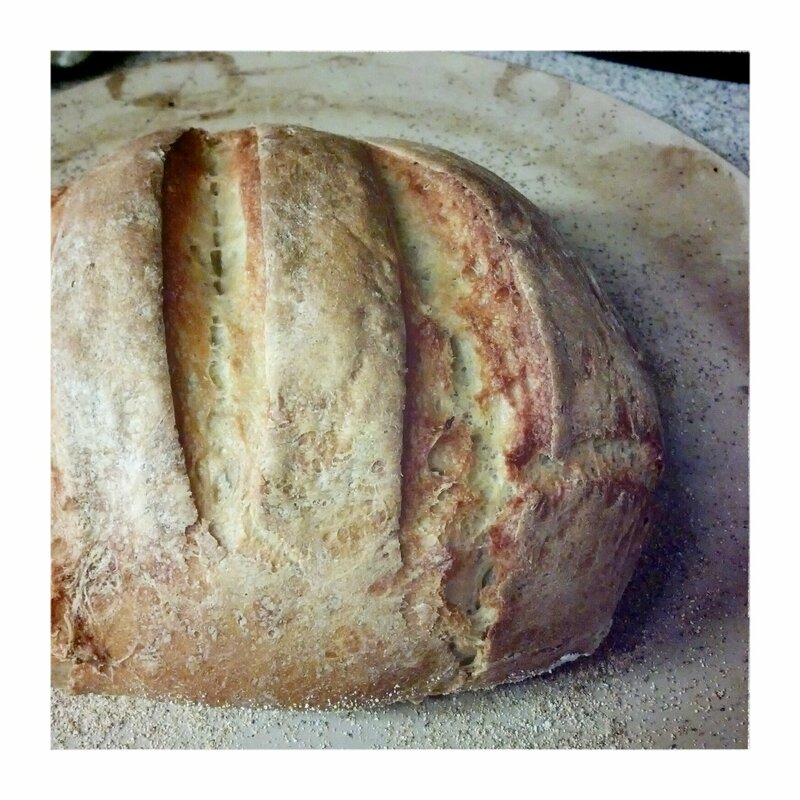 Then I found out you can make yummy, fresh-baked bread with very little time and effort. It does take some planning ahead since you have to wait for the for the dough to rise, but other than that, it’s super easy. On one of my first attempts, I tried making a loaf in the crock-pot following this recipe. I like my crock-pot. It gives the illusion of making things easier, and it doesn’t tie up my oven so I can use it for other things. I don’t know if I did something wrong, but mine did not turn out very yummy. It looked, and kind of tasted, like plastic. I stubbornly ate it because I made it and didn’t want to admit defeat. However, I conceded after choking down the first slice and eventually tossed the doomed loaf to the birds. I might try it again, but after using a similar recipe in the oven successfully, I don’t see why I need to try out the crock pot again. Unless of course, I need my oven for other things. My first loaf of crock-pot bread. It looks yummy, but it didn’t taste so yummy. The recipe I’ve been using is from Mel’s Kitchen Cafe. It’s turns out perfect every time. One thing I do that she doesn’t mention in her recipe is to dust the baking stone with cornmeal so it doesn’t stick. 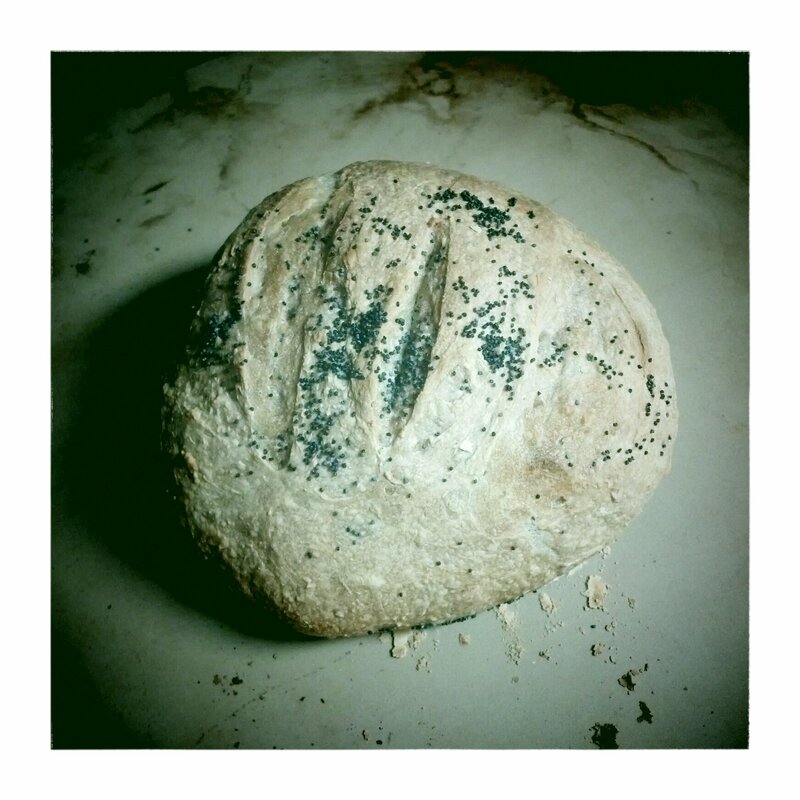 I’ve been making a batch of bread dough on Sunday, then bake it as I need it throughout the week. One batch makes about 2-3 loaves and keeps in the fridge for 5 days. The recipe works well with whole-grain flours too. I usually use half whole-grain flour and half regular flour. I think the whole-grain tastes better myself, but my son would disagree with me. Heat up about 2 TBSP of olive oil in a heavy stock pot. Cook the onions, peppers, carrots, and celery until they are soft. Add the garlic and herbs d’Provence and cook until fragrant – about 30 seconds. Add the tomatoes and chicken stock. When it gets bubbly, cover, turn the heat down, and simmer for about 30 minutes. Next, add the orzo and artichokes and cook for about 10 more minutes. If the soup is too think, you can add more stock or water. Right before you serve, squeeze the lemon juice in and give it a quick stir. You can really add any of your favorite veggies to this – zucchini, leeks, potatoes, kale, etc. If you like a meatier soup, sausage works well in this too. I’ve also added garbanzo or cannellini beans when I want a heartier soup without the meat – 1 15 oz. can of beans is a good amount for a pot of soup. If you use beans in the recipe, I would reduce the amount of pasta by half. Next I want to try my hand at homemade pita bread. I’ve found a few recipes to try out. I’ll let you know how it goes. On the running side of things, I only managed to get outside to run twice last week for a measly total of 5.22 miles. The weather has not been on my side, which is fine for this time of year I guess. However, I am ready for it to warm up and defrost. I’m beginning to wake from my hibernation phase. I’m done reading about running. I’m ready to actually run. I’ve spent the last two weeks playing in the dirt and finally got the gardens planted and some relandscaping done around the back deck. It was a lot of work, but satisfying, even if this year is already proving to be a challenging one for gardening. It’s hot, hot, hot one week and chilly the next. I sure am confused by the weather, so I’m pretty certain the plants are too. Luckily most of my sickly, little, sunburned seedlings seem to be growing and getting stronger by the day. I did lose a few though, which was sad, but this is the first year I’ve started the entire garden from seed, so I still consider this a success. I’ve taken notes and learned a lot in the process, so hopefully next year will be even better. The Romas seem to have taken the largest hit. They suffered the worst damage from my negligence during the hardening stage. I had to replace all but two of my Roma tomatoes with store bought versions from the local nursery. I couldn’t find any Roma plants, so I am trying Bradley tomatoes. I’ve never grown them before, but they looked nice and sturdy. And the tag said they are good for canning, which is usually what I use the Roma’s for. I also lost one of my heirloom tomato plants to the dog as he boldly charged through my little plot by the side of the deck before I had cordoned it off. And I’m not entirely sure what happened to the cucumbers. They appear to have been trampled, and possibly dined on, by those dastardly bunnies that love to hang out in my backyard. The good news is, I had some seeds left over. I planted them. The first round of seeds got washed away in a storm. I replanted and this time I’m seeing sprouts pushing through the soil. 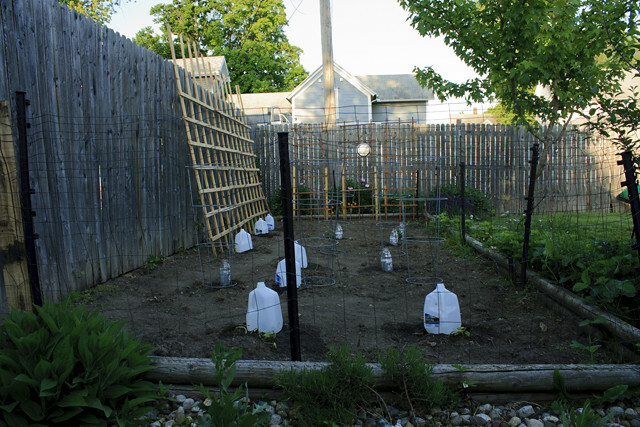 Oh yes…and some fencing with smaller openings is going up in an attempt to keep the bunnies at bay. All the squash, melons and cucumbers are being trellised against the fence. I’ve grown them this way for the past 3 years and it works out great. It saves space and helps keep the plant healthy and free from bugs because it’s off the ground. 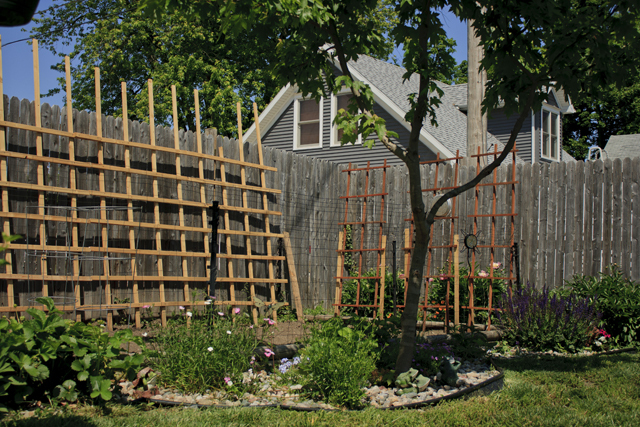 If you decide to trellis your squash and melons, make sure the trellis is well secured to the wall or fence so it will be able to support the weight of the fruit when they grow. If you are wondering what all those milk jugs in the garden are, they are my new irrigation experiment. It has been so unseasonably hot and dry here, and my plants were already sun damaged, I was looking for an inexpensive way to keep them hydrated without damaging them further. I was inspired by this pin on Pinterest. I changed it up a little bit after reading one comment about poking holes in the bottom of the jugs instead of the top as shown by the pin. It seems to be working. I think the plants look a lot happier since I’ve added the milk jugs. 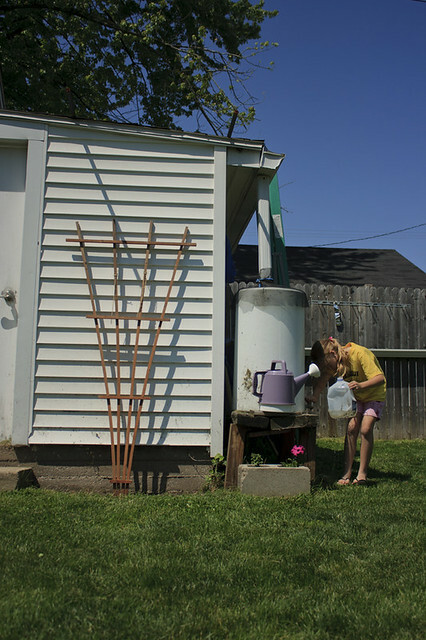 There are a few cons to this method though: it will obviously only work on smaller gardens, it’s time consuming to fill all the jugs and cart them back and forth between the rain barrel to the garden, and one odd con – when the ground gets too hot, the little hole on the bottom of the jug seems to close in on itself. I have to keep reopening the hole. Next year we might invest in a more sophisticated irrigation system, but I think this will work for this year. What I did for my milk jug irrigation system. 1. 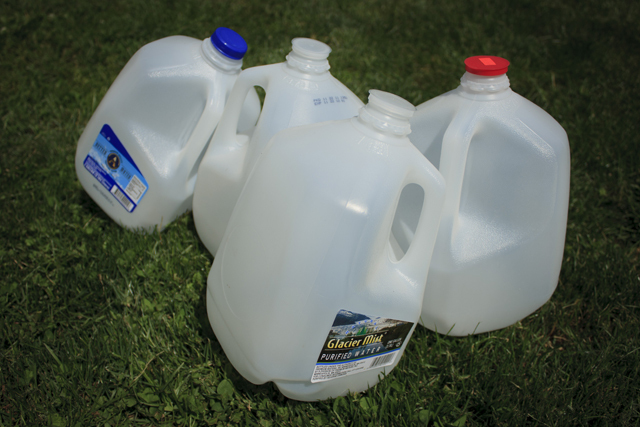 I rinsed the milk jugs, and a few large Gatorade bottles, and discarded the tops. 3. 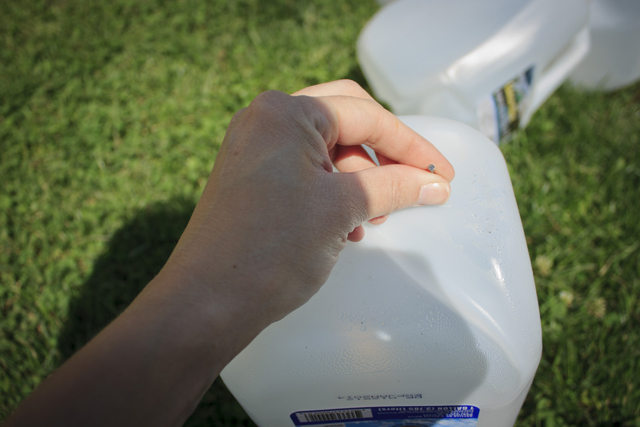 Place them near the base of the plant and the jug slowly drips out water. Make sure the side with the hole is closest to the plant. 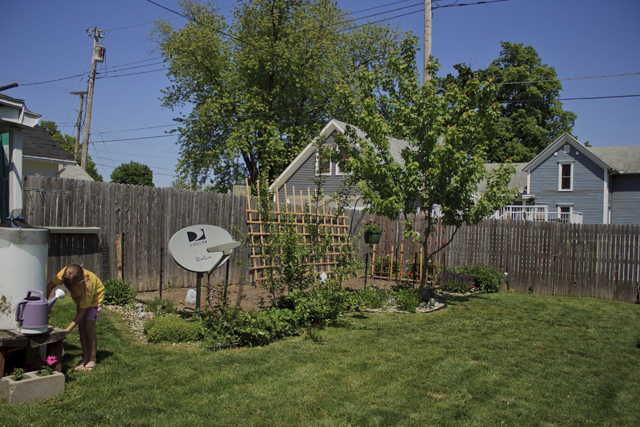 Since we have a small yard, I try to incorporate some herbs and smaller veggies in with the landscaping around the back yard as well. I grow herbs and wildflowers in the rocks around the perimeter of the main garden. 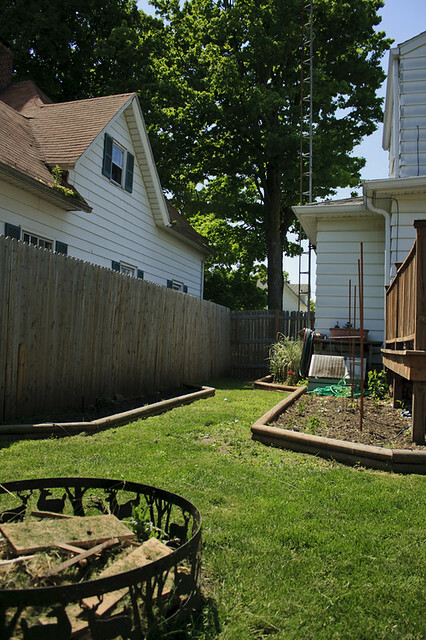 And I have a small strawberry patch and two Sugar Baby plants that will be trellised along the side of the garage. And we just relocated a bunch of ornamental grass that was overgrown along the side of our deck to the back of our fence so we could have more room for tomatoes and some other veggies. This is the first year we’ve tried fennel, so we’ll see how it goes. I found this pin with lots of helpful tips on fennel. I’ve been gardening for about 10 years now, and each year brings new lessons and challenges. It is certainly unpredictable and never boring in my opinion. It’s great therapy, helps keep me fit, and I love the idea of being able to walk outside and snip fresh herbs or veggies for dinner. The fruits I grow are usually sweeter and the cucumbers are less bitter than their store-bought counterparts. And you certainly can’t compare a fresh-picked, sun-warmed, heirloom tomato to the hard, reddish, tomato-like things they sell at the supermarkets. I also use gardening as an educational tool for the kidlets. I think it is important for them to learn about the growing cycle, where their food comes from, and how to care for our environment. And because I would like to leave the earth a little better place for the next generation, I try to get organic, non-GMO, local seeds or plants when I can, but it isn’t always possible. There seem to be more organic, non-GMO varieties available every year though, as consumers become more educated and demand more diversity in their produce. I know my little backyard garden is a small drop in the bucket, but it’s a drop just the same.